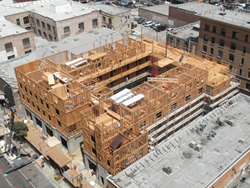 The American Wood Council (AWC) today released three manuals and a website designed to inform developers, local building departments and fire departments on how to prevent and reduce fire losses in buildings under construction. The website can be found at: http://www.ConstructionFireSafetyPractices.com. This is a timely and relevant topic, in large part due to the significant impacts large construction fires have. More importantly, the fires that have occurred were preventable by adhering to the best practices outlined in these materials. Basic Fire Precautions during Construction of Large Buildings – applies to the design and planning stages, as well as the actual construction of buildings. Hot Work during Construction of Large Buildings – describes best management practices of hot work, which is likely to reduce the occurrence of large loss fires more than any other specific topic with buildings under construction. Fire Department’s Role in Prevention and Suppression of Fires during Construction of Large Buildings – outlines pre-fire planning for large building projects, and prepares tactics and strategy for a fire if it occurs. “The trend and pattern of these types of fires show an increasing percentage are resulting in large financial losses. Our research into the causes and outcomes of these fires point to the need for more construction-site accountability and enforcement of existing fire and building codes in order to minimize the risks,” said AWC President & CEO Robert Glowinski. In 2014, the International Code Council (ICC) convened a series of roundtables to engage members and multi-disciplinary stakeholders in a discussion about emerging safety issues. One such roundtable discussion focused on fires in multi-story buildings under construction. “AWC listened attentively to the discussion that occurred during the ICC roundtable and the recommendations that resulted. They responded with an outstanding website, which contains many educational resources for all construction site workers and visitors. In order to achieve the desired results, several recommendations in the roundtable report will require developers, builders and governmental agencies to take action,” said Safer Buildings Coalition Executive Director Alan Perdue, who was the ICC roundtable moderator. Prior to the ICC roundtables, AWC and FireforceOne had established a working group of international stakeholders with diverse perspectives on construction site fire safety to guide development of these materials. The manuals are available for free download at: http://www.ConstructionFireSafetyPractices.com. The American Wood Council (AWC) is the voice of North American wood products manufacturing, representing over 75 percent of an industry that provides approximately 400,000 men and women in the United States with family-wage jobs. AWC members make products that are essential to everyday life from a renewable resource that absorbs and sequesters carbon. Staff experts develop state-of-the-art engineering data, technology, and standards for wood products to assure their safe and efficient design, as well as provide information on wood design, green building, and environmental regulations. AWC also advocates for balanced government policies that affect wood products.